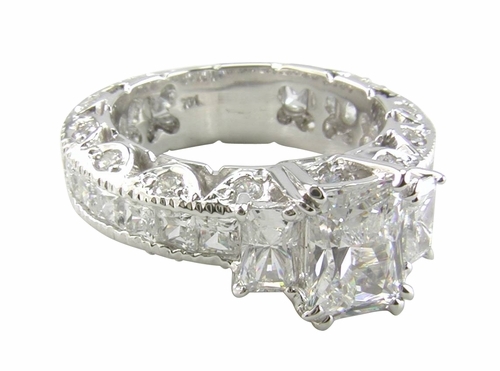 The Three Stone Cubic Zirconia Emerald Cut Princess Cut Estate Eternity Ring is a three stone ring that features a 1.5 carat 8x6mm emerald radiant cut with a .50 carat 5x3mm emerald radiant cut cubic zirconia on each side. 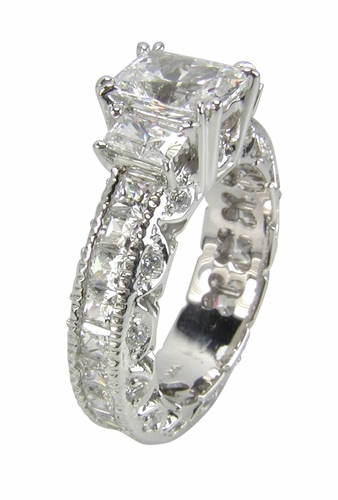 An eternity of channel set princess cut square cubic zirconia encircle the entire estate style shank and are further enhanced by a beaded detailing on each side with a three stone emerald cut center. 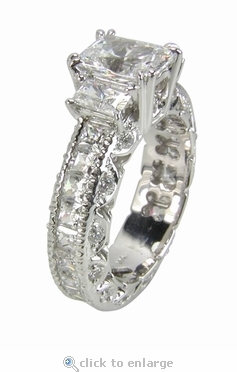 Both vertical sides of the three stone emerald cut eternity styled shank feature a beautifully detailed band accented with pave set cubic zirconia rounds that add to its estate style look. The Heaven three stone emerald cut and princess cut estate eternity ring has a total carat weight of approximately 4 carats and the shank measures approximately 6mm in width.